One of the smartest, simplest and most affordable forms of senior care is available via live-in care. What Is Live-In Care And How Much Does It Cost? Live-in care means nobody has to undergo stressful or scary transitions from a home they love to an assisted living facility. Rather, live-in care provides compassionate companionship and personal care services, including an array of relevant caregiving and light housekeeping tasks, all of which take place in the comfort of the client’s home. The cost of live-in homecare is a fraction of the price of facilities-based care, plus live-in care is provided in a holistic, family-style way, allowing seniors, their spouses, and pets to remain in the place they call Home. Read, 10 Signs Your Parents Need Assistance to Safely Stay at Home, to learn more about whether or not now is the right time to provide live-in care for your loved one. Before we continue with a description of live-in care services, it’s important to note that live-in care is not the same as 24-hour care. Live-in care typically requires the hiring of one caregiver per day, for a daily rate, who stays in the home for 24-hour shifts. The caregiver should be provided a comfortable bed to sleep in (a private room/space is best) and is given an 8-hour shift to sleep. They also get breaks throughout the day for lunch, dinner, etc., however the caregiver will not leave the client unless instructed to do so, such as a grocery store visit. In an emergency, from time-to-time, the sleeping caregiver may be woken up to assist in some way, or provide comfort, but these interruptions should be rare and not in the arena of more intentional caregiving. If the senior needs more in-depth support or care during the nighttime hours, he or she requires 24-hour care. 24-hour care is the next level of home care, requiring at least two caregivers per day, who provide alert, attentive care during the nighttime hours as well as daytime hours. Caregivers trade-off 12-hour shifts and billing is done by the hour. Reasonable breaks are required for the caregiver and any relief care required would be performed by a family member or another professional caregiver who is brought in at an hourly rate. A live-in caregiver offers all of the services provided by his/her agency. This runs the gamut from companionship and light housekeeping to daily hygiene and toileting assistance, meal preparation and so on. Having a person living in the home not only offers a safer and more secure living situation for seniors or those with early- to mid-stage dementia, it also provides essential mental/social stimulation and healthy human contact. Once seniors lose the ability to drive, their world shrinks considerably without safe transportation alternatives. Live-in caregivers can use their car, or the client’s car, to offer transportation to and from weekly appointments and social events. Similarly, live-in caregivers can run errands and do the grocery shopping so the client has more energy to do the things he or she enjoys. Caregivers can accommodate light housekeeping, laundry, and bedding changes to ensure the senior’s house is clean, sanitary and safe. Mobility issues, existing medical conditions and/or dementia make it difficult for many seniors to keep up with basic hygiene requirements, dressing, and toileting. Live-in caregivers provide help with all of these personal tasks. Preparing healthy and delicious meals becomes increasingly difficult as we age, so caregivers offer these services to ensure their clients are well-nourished, hydrated and adhering to doctor’s orders concerning dietary restrictions. Forgetting to take pills or replenish prescriptions has life-altering consequences for seniors, as does the inability to pay bills on time. If you feel comfortable, you can ask your live-in caregivers to act as a personal assistant, keeping things in order from medication reminders to bill-paying and sending of the family/friend birthday and holiday cards. Whether a family caregiver needs a day or a few weeks off to honor their personal and family schedules, respite care is available in the form of short shifts or even full-days (aka live-in care) as needed. Review our post, Preparing for Live-In Care, to facilitate a smooth transition for your loved one, his/her family and the prospective caregiver(s). 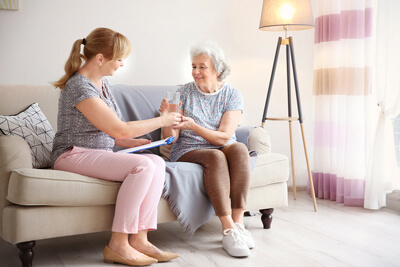 Anyone hiring a home care provider to assist with the care of themselves or a loved one should take careful steps to hire licensed, experienced professionals. Many care providers offer their services freelance, and these services may seemmore affordable than those offered by professional caregiving agencies. Be aware, however, that you are legally responsible for performing regular background and DMV checks, ensuring caregivers are paid as per the law, provided with certain benefits and that you adhere to your local, state, and federal tax laws. As a result, senior experts advocate hiring caregivers from proven, reputable agencies to ensure you’re getting a licensed, caregiver who is compassionate, professional and has a solid track record. This also gives you the opportunity to have a free, in-home assessment, from which you’ll glean important tips and recommendations for making the home safer and more accessible for your loved one and to create thoughtful long-term care plans that address current and future care needs. Visit, Choosing the Right Senior Care Service Provider, a detailed list of seven simple steps you can take to ensure the agency or live-in caregivers are licensed, vetted, and worthy of the services they’ll be providing for your household or to care for a loved one. It’s so important to find caregivers who are both qualified and experienced, and whose personalities match well. The relationship should be a positive one for all involved.